A meeting of the Shareholders of the Corporation (the "Shareholders") will be held annually for the purpose of electing directors (the "Directors") of the Corporation and for the purpose of doing other business as may come before the meeting. If the day fixed for the annual meeting is a legal holiday in the Commonwealth of Virginia, the annual meeting will be held on the next succeeding business day or on a date determined by the board of directors for the Corporation (the "Board") that is no later than two weeks after the date specified in the meeting notice. The Corporation must hold its annual meeting within 15 months of the organization of the Corporation or its last annual meeting. If the annual meeting is not held within that time period then any shareholder entitled to participate in the meeting may apply to the circuit court of the city or county where the Corporation's principal office, or, if none in Virginia, its registered office, is located, to fix the time and place of the meeting. By the holders of shares entitled to cast in total not less than 10 percent of the votes on any issue proposed for the meeting where written requests describing the purpose or purposes for the special meeting are signed, dated and delivered to a member of the Board or other Officer of the Corporation. The Board will determine the time, place and date of any special meeting provided that, in the case of a special meeting called by the requisite percentage of Shareholders in accordance with these Bylaws, the Board will issue notice of the special meeting within 30 days of receipt of the written demand(s) by the relevant Officer of the Corporation. 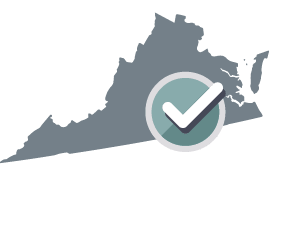 The annual meetings or special meetings of the Shareholders may be held at any place in or out of the Commonwealth of Virginia at a place to be determined at the discretion of the Board. If no designation of the location is made for any annual or special meeting of the Shareholders, the place of the meeting will be the Registered Office of the Corporation in Virginia. The Corporation must hold its annual meeting within the earlier of: a) six months after the end of the Corporation's fiscal year or; b) fifteen months after its last annual meeting. If an annual meeting is not held within that time period, a Shareholder may direct a request in writing to the Chairman of the Board of the Corporation to hold the annual meeting. If a notice of meeting is not given within 60 days of that request then any Shareholder entitled to vote at an annual meeting may apply to any court having jurisdiction for an order directing that the meeting be held and fixing the time and place of the meeting. The written notice of any meeting will be given not less than 10 days, but not more than 60 days before the date of the meeting to each Shareholder entitled to vote at that meeting. The written notice of the meeting will state the place, date and hour of the meeting, and, in the case of a special meeting, the purpose or purposes for which the meeting is called. If mailed, notice is given when the notice is deposited in the United States mail, postage prepaid, and directed to the Shareholder at the address of the Shareholder as it appears on the records of the Corporation. An affidavit of the secretary (the "Secretary") of the Corporation that the notice has been given will, in the absence of fraud, be prima facie evidence of the facts stated in the notice. A written waiver, signed by the person entitled to a notice of meeting, or a waiver by electronic transmission by the person entitled to that notice, whether before or after the time stated in the notice, will be deemed equivalent to the person receiving the notice. Further, attendance of a person at a meeting will constitute a waiver of notice of that meeting, except when the person attends a meeting for the express purpose of objecting at the beginning of the meeting to the transaction of any business because the meeting is not lawfully called or convened. Any action to be taken at any annual or special meeting of Shareholders, may be taken without a meeting, without prior notice and without a vote, if a consent or consents in writing, setting forth the action to be taken, is signed by the holders of outstanding stock having not less than the minimum number of votes that would be necessary to authorize or take the action at a meeting at which all shares entitled to vote on the matter were present and voted is delivered to the Corporation. Every written consent will bear the date of signature of each Shareholder who signs the consent. However, no written consent will be effective unless the consent is delivered, either by hand or by certified or registered mail, within 90 days of the earliest dated consent, to the Corporation for inclusion in the minutes or filing with the corporate records. Shareholders may not participate in a meeting of the Shareholders by any means of remote communication. All Shareholders must be present in person or by proxy to participate in a meeting of the Shareholders. During ordinary business hours, at the Registered Office of the Corporation or at its Principal Office or at the office of its transfer agent or registrar. If the Corporation decides to make the list available on an electronic network, the Corporation will ensure that this information is available only to Shareholders of the Corporation. If the meeting is to be held at a physical location, then the list will be produced and kept at the time and place of the meeting during the whole time of the meeting and may be inspected by any Shareholder who is present. If any Director willfully neglects or refuses to produce the list of Shareholders at any meeting for the election of Directors those Directors will be ineligible for election to any office at that meeting. The Shareholders' List will be the only evidence as to who are the Shareholders entitled by this section to examine the list required by this section or to vote in person or by proxy at any meeting of Shareholders. A minimum of __________ percent of the shares entitled to vote, present in person or represented by proxy, will constitute a quorum entitled to take action at a meeting of Shareholders. In all matters other than the election of Directors, any act of the Shareholders must be passed by an affirmative vote of the majority of the shares present in person or represented by proxy at the meeting and entitled to vote on the matter. Directors will be elected by a majority of the votes of the shares present in person or represented by proxy at the meeting and entitled to vote on the election of Directors. Where a separate vote by a class or series or classes or series of shares ("Eligible Shares") is required, __________ percent of the outstanding Eligible Shares present in person or represented by proxy, will constitute a quorum entitled to take action with respect to that vote on that matter. Any act to be taken must be passed by an affirmative vote of the majority of the outstanding Eligible Shares present in person or represented by proxy. Subject to the Articles of Incorporation, each Shareholder will be entitled to one vote for each share of stock held by that Shareholder. Each Shareholder entitled to vote at a meeting of Shareholders or to express consent or dissent to corporate action in writing without a meeting may authorize another person or persons to act for that Shareholder by proxy, but no proxy will be valid after 11 months from the date of its execution unless the proxy provides for a longer period. Execution of a proxy may be accomplished by the Shareholder or by the authorized Officer, Director, employee or agent of the Shareholder, signing the writing or causing that person's signature to be affixed to the writing by any reasonable means including, but not limited to, by facsimile signature. A duly executed proxy will be irrevocable if it states that it is irrevocable and if, and only as long as, it is coupled with an interest sufficient in law to support an irrevocable power. A proxy may be made irrevocable regardless of whether the interest with which it is coupled is an interest in the shares or an interest in the Corporation generally. Persons holding shares in a fiduciary capacity will be entitled to vote the shares so held. Persons whose shares are pledged will be entitled to vote, unless, in the transfer by the pledger on the books of the Corporation, that person has expressly empowered the pledgee to vote the shares, in which case only the pledgee, or that pledgee's proxy, may represent and vote the shares. The business and affairs of the Corporation will be managed by or under the direction of the Board. The Board will consist of __________ members, each of whom will be a natural person. Directors need not be Shareholders. Each Director will hold office until that Director's successor is elected and qualified or until that Director's earlier resignation or removal. Any Director may resign at any time upon notice given in writing or by electronic transmission to the Corporation. In order to transact business at a meeting of the Directors, a quorum of __________ percent of the total number of Directors eligible to vote will be required. The vote of the majority of the Directors present at a meeting at which a quorum is present will be the act of the Board. By resolution, the Board may provide the time and place, either within or without the Commonwealth of Virginia, for the holding of regular meetings without any notice other than that resolution. Special meetings of the Board may be called by or at the request of the President or by a majority of the Directors. The person or persons calling that special meeting of the Board may fix any date, time or place, either within or without the Commonwealth of Virginia, to be the date, time and place for holding that special meeting. Written notice of the date, time, and place of a special meeting of the Board will be given at least __________ days prior to the date set for that meeting. The written notice can be given personally, by mail, by private carrier, by telegraph, by telephone facsimile, or by any other manner as permitted by the Virginia Stock Corporation Act. The notice will be given by the Secretary or one of the persons authorized to call Directors' meetings. If written notice is mailed, correctly addressed to a Director's address as provided in the Corporation's current records, the notice will be deemed to have been given to that Director at the time of mailing. If written notice is sent by private carrier or if the written notice is sent by United States mail, postage prepaid and by registered or certified mail, return receipt requested, the notice will be deemed to have been given to a Director on the date shown on the return receipt. Otherwise notice is effective when received by a Director. Notice of any Directors' meeting may be waived by a Director before or after the date and time of the meeting. The waiver must be in writing, must be signed by a Director, and must be delivered to the Corporation for inclusion in the minutes or filing with the corporate records. The attendance of a Director at a meeting of the Board will constitute a waiver of notice of that meeting except where a Director attends a meeting for the express purpose of objecting to the transaction of any business because the meeting is not lawfully convened. Any action to be taken at any meeting of the Board or of any committee of the Board may be taken without a meeting if all members of the Board or committee, as the case may be, consent to it in writing, or by electronic transmission and the writing or writings or electronic transmission or transmissions are filed with the minutes of proceedings of the Board, or committee. This filing will be in paper form if the minutes are maintained in paper form and will be in electronic form if the minutes are maintained in electronic form. Remote communication means any electronic communication including conference telephone, video conference, the Internet, or any other method currently available or developed in the future by which Directors not present in the same physical location may simultaneously communicate with each other. A meeting of the Board may be held by any means of remote communication by which all persons authorized to vote or take other action at the meeting can hear each other during the meeting and each person has a reasonable opportunity to participate. This remote participation in a meeting will constitute presence in person at the meeting. When vacancies or newly created directorships resulting from any increase in the authorized number of Directors occur, a majority of the Directors then in office, although less than a quorum, or a sole remaining Director will have the power to appoint new Directors to fill this vacancy or vacancies. Each new Director so chosen will hold office until the next annual meeting of the Shareholders. If at any time, by reason of death or resignation or other cause, the Corporation should have no Directors in office, then any Officer or any Shareholder or an executor, administrator, trustee or guardian of a Shareholder, or other fiduciary entrusted with like responsibility for the person or estate of a Shareholder, may call a special meeting of Shareholders for an election to fill the vacancy. When one or more Directors resign from the Board and the resignation is to become effective at a future date, a majority of the Directors then in office, including those who have so resigned, will have the power to appoint new Directors to fill this vacancy or vacancies. The appointments of these new Directors will take effect when the resignation or resignations are to become effective, and each new Director so chosen will hold office until the next annual meeting of the Shareholders. Any Director or the entire Board may be removed, with or without cause, by the holders of a majority of the shares then entitled to vote at an election of Directors at a special meeting of the Shareholders called for that purpose. A director may be removed only if the number of votes cast to remove the director exceeds the number of votes cast not to remove him or her. Meetings of the Board will be presided over by the President, or in the President's absence by a Director chosen at the meeting. The Secretary will act as secretary of the meeting, but in the absence of the Secretary, the person presiding at the meeting may appoint any person to act as secretary of the meeting. The Chairman of the Board, if present, will preside at all meetings of the Board, and exercise and perform any other authorities and duties as may be from time to time delegated by the Board. The Board will, by resolution, fix the fees and other compensation for the Directors for their services as Directors, including their services as members of committees of the Board. All changes to Director compensation are subject to ratification by the Shareholders. The Director delivers written notice of the Director's dissent or abstention to the presiding officer of the meeting before the adjournment of the meeting or to the Corporation within a reasonable time after adjournment of the meeting. Any right to dissent or abstain from the action will not apply to a Director who voted in favor of that action. The Board may designate one or more committees, each committee to consist of one or more of the Directors of the Corporation. The Board may designate one or more Directors as alternate members of any committee, who may replace any absent or disqualified member at any meeting of the committee. In the absence or disqualification of a member of a committee, the member or members present at any meeting and not disqualified from voting, whether or not that member or members constitute a quorum, may unanimously appoint another member of the Board to act at the meeting in the place of any absent or disqualified member. Adopting, amending or repealing any Bylaw of the Corporation. Each member of a committee will serve at the pleasure of the Board. The method by which Directors' meetings may be called and the notice requirements for these meetings as set out in these Bylaws will apply to any committee designated by the Board as appropriate. The requirements for a quorum for the Board as set out in these Bylaws will apply to any committee designated by the Board as appropriate. The requirements and procedures for actions without a meeting for the Board as set out in these Bylaws will apply to any committee designated by the Board as appropriate. Any member of a committee may be removed at any time, with or without cause, by a resolution adopted by a majority of the full Board. Any member of a committee may resign from the committee at any time by giving written notice to the Chairman of the Board of the Corporation, and unless otherwise specified in the notice, the acceptance of this resignation will not be necessary to make it effective. Any vacancy in a committee may be filled by a resolution adopted by a majority of the full Board. A committee will elect a presiding officer from its members and may fix its own rules of procedure provided they are not inconsistent with these Bylaws. A committee will keep regular minutes of its proceedings, and report those minutes to the Board at the first subsequent meeting of the Board. The Officers of the Corporation (individually the "Officer" and collectively the "Officers") will consist of the President, a treasurer (the "Treasurer") and the Secretary. The Officers will be appointed by the Board at the first meeting of the Directors or as soon after the first meeting of the Directors as possible, if Officers have not already been appointed. Any appointee may hold one or more offices. Each Officer will hold office until a successor is duly appointed and qualified or until the Officer's death or until the Officer resigns or is removed as provided in these Bylaws. Any Officer or agent appointed by the Board or by the Incorporators may be removed by the Board at any time with or without cause, provided, however, any contractual rights of that person, if any, will not be prejudiced by the removal. The Board may fill a vacancy in any office because of death, resignation, removal, disqualification, or otherwise. To perform all other duties and carry out other responsibilities as determined by the Board. To perform all other duties and carry out other responsibilities as prescribed by the Board or the President. Perform all duties incidental to the office of Secretary and any other duties as from time to time may be delegated to the Secretary by the President or the Board. The Board reserves the authority to delegate the powers of any Officer to any other Officer or agent, notwithstanding any provision in these Bylaws. Without authorization by a resolution of the Board, the Corporation is prohibited from making or accepting loans in its name, or issuing evidences of indebtedness in its name. The authorization of the Board for the Corporation to perform these acts can be general or specific. All checks, drafts, or other orders for the payment of money, notes, or other evidences of indebtedness issued in the name of the Corporation must be signed by a designated Officer or Officers, agent or agents of the Corporation and in a manner as will from time to time be determined by resolution of the Board. All funds of the Corporation not otherwise used will be deposited to the credit of the Corporation in banks, trust companies, or other depositories designated by the Board. The President, or another Officer or agent designated by the Board will, with full power and authority attend, act, and vote, on behalf of the Corporation, at any meeting of security holders or interest holders of other corporations or entities in which the Corporation may hold securities or interests. At that meeting, the President or other delegated agent will have and execute any and all rights and powers incidental to the ownership of the securities or interests that the Corporation holds. The Board may give authority to any Officer or agent, to make any contract or execute and deliver any instrument in the name of the Corporation and on its behalf, and that authority may be general or specific. Bylaws - the purpose of these bylaws (the "Bylaws") is to provide rules governing the internal management of the Corporation. Chairman of the Board - Once a Board of Directors has been appointed or elected by the Shareholders, the Board will then elect a chairman (the "Chairman of the Board"). 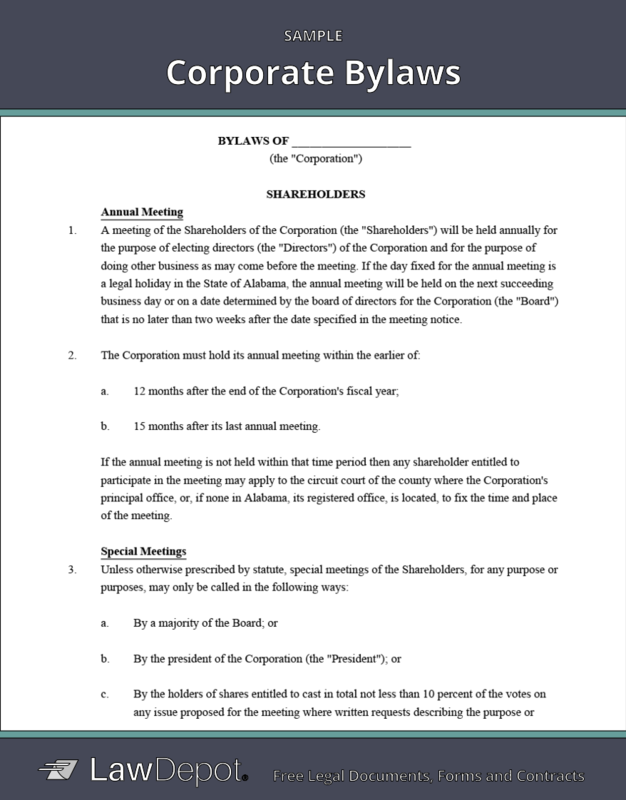 The Chairman of the Board will act to moderate all meetings of the Board of Directors and any other duties and obligations as described in these Bylaws. Corporate Officer - A corporate officer (individually the "Officer" and collectively the "Officers") is any individual acting for or on behalf of the Corporation. An Officer of the Corporation will usually be appointed to a specific task such as secretary, president, treasurer or other similar position. One person may hold several offices. The Officers will manage the day-to-day operations of the Corporation and report to the Board of Directors. Principal Executive Office - The Principal Executive Office for the Corporation is where the President of the Corporation has an office. Principal Office - The Principal Office of the Corporation is the address designated in the annual report where the executive offices of the Corporation are located. Principal Place of Business - The Principal Place of Business is the address at which the Corporation conducts its primary business. Registered Office - The Registered Office is the physical street address within the state where the registered agent can be contacted during normal business hours for service of process. Shareholders' List - A Shareholders' List is the complete record of the owners of shares of stock in the Corporation. Corporate Bylaws are a set of written rules used by a corporation to organize its internal management. Company bylaws also outline the policies and responsibilities for the shareholders, directors, and officers of a corporation. What are some of the terms in Corporate Bylaws? Which decisions should be considered in Corporate Bylaws? Corporate Bylaws are also used to decide the number of directors the corporation will have, who is eligible to appoint officers, and whether or not the corporation can lend money to its officers, directors, or employees. When do Corporate Bylaws come into effect? Usually, the directors of a corporation formally adopt Corporate Bylaws at the first Directors' Organizational Meeting. After the bylaws are formed and agreed to at the first meeting, the rules and procedures included in the company bylaws will come into effect (i.e. will start being used) and will guide the company's internal management thereafter until the company agrees to change its Corporate Bylaws using a Directors' Resolution or Shareholders' Resolution. Can Corporate Bylaws be amended? Yes, Corporate Bylaws may need to be amended from time to time. Corporate regulations and laws occasionally change, as do the business needs of the corporation. It's important to update your Corporate Bylaws to reflect these changes. Usually, shareholders and directors must vote to pass bylaw amendments. After an amendment has been agreed to in writing (using a resolution), it is adopted by the directors and integrated into the Corporate Bylaws. What is the difference between Articles of Incorporation and Corporate Bylaws? Articles of Incorporation are legal papers that are filed with the Secretary of State in order for a business to be registered as a corporation. Corporate Bylaws are internal policies that lay out the day-to-day rules and operating procedures for a corporation after it has been formed. Company bylaws do not need to be filed with the state. Personalize your Corporate Bylaws template.